Gitsplitta wrote: Sooo... what are the cars for again? Broadly speaking, you grab some toy cars, decide what body/engine type best suits (giving the vehicle's handling, speed, durability and weight) and race round a track or scenario from those included. Vehicles move once per gear that they're in - so everyone acts once in first gear, but may (and almost certainly will) change gears, giving another move in second, and so on. Faster/lighter vehicles can access all the way up to gear 6, but that typically makes handling more Hazardous. Handy reference cards are provided, with a box for a d6 to mark the current gear, and movement templates (very Flight Path) determine trajectory. Each time a vehicle moves, it also rolls Handling: A 1 adds a Hazard token, with 6 Hazard tokens leading to a car Wiping Out - potentially flipping, and grinding to a halt back at Gear 1. A 2 is a slide, which can be surprisingly advantageous - power sliding/drifting, effectively - and a 3 a Spin up to 90 degree, generally less useful. Finally, a 4-6 is a Shift result changing gear, or cancelling a negative result, though at some gears (and for some vehicles) certain maneuvers are considered Trivial so grant a free Shift also. 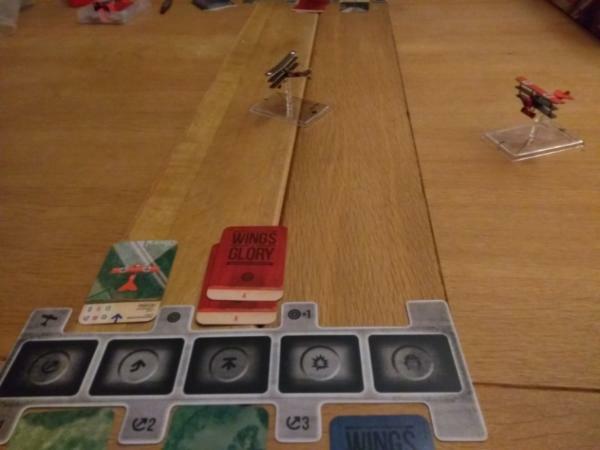 Whilst there's a far bit of dice rolling, it's far from clumsy, and a very easy system to use; the kids very quickly twigged you could power-slide into some vicious sideswipes, for example. Which leads neatly into the Rule of Maximum Car-nage. This is a game that puts the Death into Death Race, and as such the Rule states that if in doubt, whatever causes the most damage happens. It's very much a game of slamming, ramming and shooting your way to victory, with a plethora of weapon options to purchase from the conventional to the outlandish, along with a variety of Perks to make your individual crew stand-out. Again, the kids realised as soon as I pulled in front of them in our first race the thing to do was to crash, smash and bash me between them. The weapon rules are likewise simple, with ranges measured using the straight maneuver templates and various d6 to represent damage (4+ to do a point of damage, double on a 6). It almost feels like a tabletop Video Game, in a very positive way, with its Mario Kart and RAGE levels of anarchy. The game's setting, an alternate present where Earth is wasteland, anyone with money lives on Mars, and audiences watch murderous Saturday Night Road Races, is both knowing and accessible, with a variety of in-game factions that lend you advantages in terms of loadouts and driver skills. RUTHERFORD specialises in military hardware, so they get more ammo and access to Tanks/Helicopters also, which is not as overpowered as you might fear. WARDEN, as a faction, is made up of prisoners welded into proper death machines, and whilst they're likewise very shooty, are even better at blowing up on top of their opponents. IDRIS is the other "speed" faction, but instead relies on volatile (and, hilarious) turbo-boosts and more dakka - they are literally a Cult of Speed. MISHKIN is what a member of the Gaslands community charmingly describe as the "wildcard superweapon wombo combo" faction. The Mad science tech faction, with lasers, hover rays - I'm waiting for a bubble cannon, personally - and dynamos in the vehicles, so speed becomes your ammo supply. SLIME, last of the base-game factions and not at all coincidentally Australian, is the meta sponsor: generating as much hazard as possible, giving them to other people, and using expendable vehicles (mostly, cheap buggies with grenades etc). As my eldest pointed out, they're Monopoly: they don't win, they make everyone else lose. That's what I'm building first. Each faction has access to various weaponry and equipment, as noted, at lower cost or with some twist on it: The Warden, for example, lets you take cheap but flimsy Prison Cars, for example. Also, your drivers can access two Skill trees, such as Handling and Performance. The other major mechanical element, though optional, is Audience Votes. Gaslands is a TV show, after all, and the audience love to see their favourites do well. Audience votes, however, tend to favour the underdog, with votes generated (usually by Wiping Out, though there are some faction-specific variants) allowing you to get to respawn in the game if you've totally crashed out. It's a neat mechanic, and means that you can always be playing rather than sitting back once you've burned out - plus being very much in keeping with the Video-Game feel of the game as a whole. It's a smashing (sorry) wee game this, and with free downloadable rules for more crazy weapons, actual Pirates and wannabe Policeman - and even a Truckasaurus - there's masses of room for every play style and taste. The game is Gaslands, post apocalypse mad max car game. Different factions fight it out, uses matchbox/hot wheels sized cars. Made by Osprey games as one of their 64pagebluebook games. Rulebook is less than $20. You can play with 5 or so cars depending on points per game. It really exploded as a game last year when it came out. Dicearethemost expensive thing, I made my own and you can use standard D6s and just consult a chart. Also love the team name Serenity Browncoats . I’m waiting on my serenity crew to arrive for Blackwater Gulch. I have some gaslands ideas kicking about. Like what you have going on here bud. Gitsplitta wrote: Sounds awesome, thanks guys. Camkierhi wrote: I have some gaslands ideas kicking about. Like what you have going on here bud. Lots of builds started tonight, and lots of work still to do. No idea what to mount in the back of the pickup. Obviously, gaps in the screen armour etc need filled. If I'd had half a brain I'd've used boiling water to shape them first. Driver on the left did get the boiling water treatment; he was a standing model originally. Not sure if his car's gun isn't a bit small. No idea what to mount on the middle car. Because clearly they should have pimpin rides. Other bits and pieces are coming, including the Miyazaki (which are just sleek sci-fi cars) and a drag racer for my Slime. Need to find some generally useful vehicles for Rutherford and Warden, nothing really yet. Hopefully, getting a game or two tomorrow with erithromycin. The pickup truck needs Lucy Liu standing in back, firing a pintle-mounted heavy machine gun bolted to the floor. Barring that, take care of those pesky helicopters. So Sherriff, what would you like us to put on your patrol car? So, game night finally happened in the house. erithromycin brought me a copy of the Fokker Vs Sopwith starter he'd nabbed from Australia, so a good night was had. Mechanically, the Fokker has very tight right turn to reflect the engine's torque. Genius game design. So, I blew him out of the sky as the Red Baron in both our games. Good times. I can't even express how good it was just to geek out. My original Patrol team will be my Rutherford team. Muscle cars and rednecks? Seems legit. 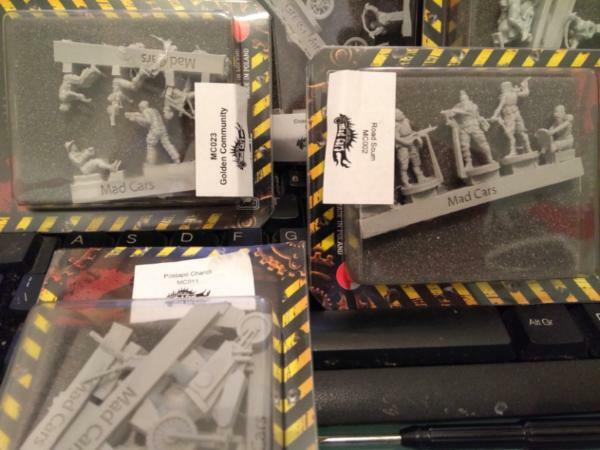 I got another cracking maildrop, this time from Mad Cars, Greenminiatures.com 's 20mm post apoc madness. Choppers, Motorcross bikes and... Vesperados! Much fun to be had. Some paint got applied today on my plaguebearers, next layer of skin tone. Nothing terribly exciting, or even pic worthy, but it got done. Got to keep in Papa N' s good books. Subject: Re:Graven's Shelf of Shame Jan 23rd: Wings of Glory, batmobiles, and... scooters?! Stop it , you get all this free stuff and I cannot keep up . Those 20mm people look legit . 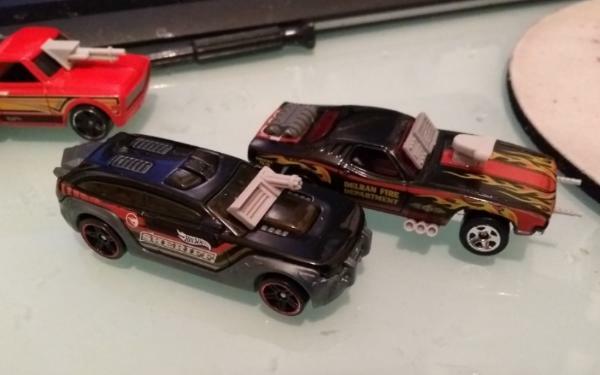 I went big truck route with my Rutherford, using vehicles from hot wheels Jurassic Park line. 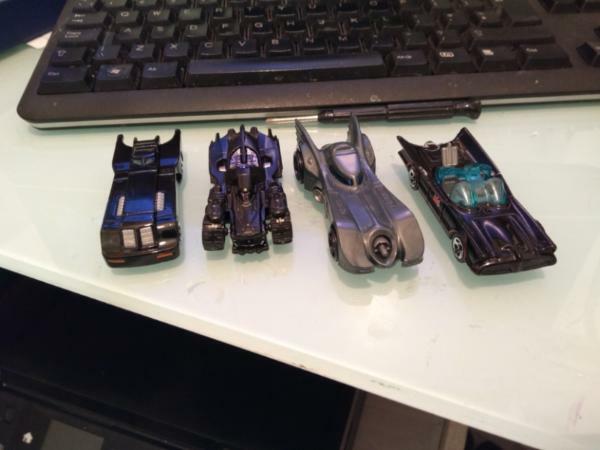 ^ I know, I know, sorry I had planned to do that as well but the batmobiles were too perfect, and the muscle cars do have a good feel for Rutherford, in a Dukes of Hazard kinda way. Well, this has been a beast of a week. Work has been monstrous. I am a very calm person, usually, but I really lost my temper yesterday. Ah well. So, last night consisted of heavy metal, whisky, haggis, beer, and working on tiny cars. Nuts. Feet snapped through inside packaging... I'm sure we can do something about that. Started digging through my bits box for really random stuff. I think this was a tank hatch. And on that note, let's get pimpin'! My favourite thing is the RoB clip as a ram also, big damn gun as Briancj wisely suggested. 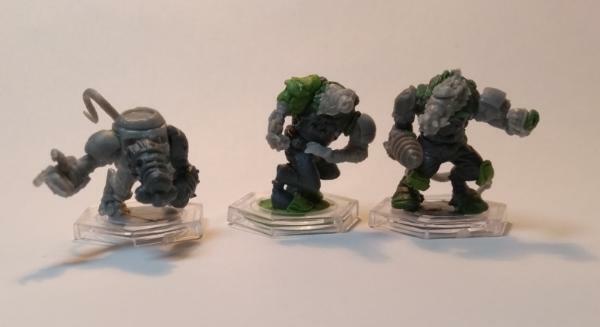 the Rejects, a gang of alien mercenaries who found that murderball pays better than, well, murder. The extras will give me a couple of alternate poses and a prone figure, I reckon: the next dB challenge is build a team with at least one converted model. If I hadn't done my Cyborgs already, I'd've done some for that, but never mind. Think this is a quiet weekend. #1's back from Activity Camp, so we'll see if he wants to paint or play something. Sorry to hear about the temper trigger. It happens to the best of us (and I'm not an example of 'best'). Glad to see you took my advice re: pickup truck! Mostly because I now get to be right about something, which is rare. ^ I took both of your pieces of advice you'll notice. Double the win ! Doesn't help that the rules for Transformers seem...in development? It is a fun game with a great property and cool character cards, though. I must stay away from anything labeled Collectible . My CDO (alphabetic version of OCD ) would be another drain on a wallet. youwashock wrote: Doesn't help that the rules for Transformers seem...in development? It is a fun game with a great property and cool character cards, though. Yeah for a WotC game it is remarkably bare-bones. Theophony wrote: I must stay away from anything labeled Collectible . My CDO (alphabetic version of OCD ) would be another drain on a wallet. as if you need more to buy, right. The boy has been planning his Raven Guard force, thanks to a bit of input from me asking around on the RG FB group. Captain, jump pack, lightning claws. 3x5 Primaris, w. Aux. Grenade launcher (that'll be a kitbash then ), MC Stalkers on the Sgts. 3x Inceptors, 2 Bolt, 1 Plas - we Kitbashed a couple of from plasma guns, pics once they get cables and built. 5 Scout snipers, with rocket launcher. 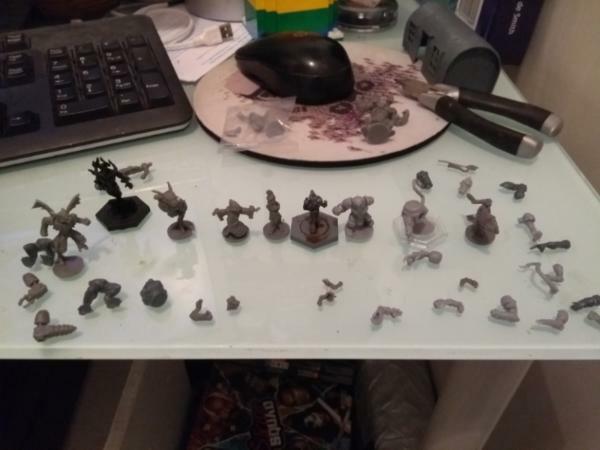 Devestator Squad, with 3 Rocket Launchers (and something else or possibly 4 RLs, it depends if I can kitbash one), serg with signum and cherub (again, not a clue how to make a mechababy ). Some Hellblasters with an apothecary for coverage. So he was digging through the bits box today and decided to build the apothecary. It'll need a wee drill, and we used the opportunity to test a press-moulded (shhhh!) Raven Guard icon. Need to hold off until more armour arrives, beyond a bit of filling here and there. Crappy weekend, brought my baggage home with me. Need to find a better place for my head. 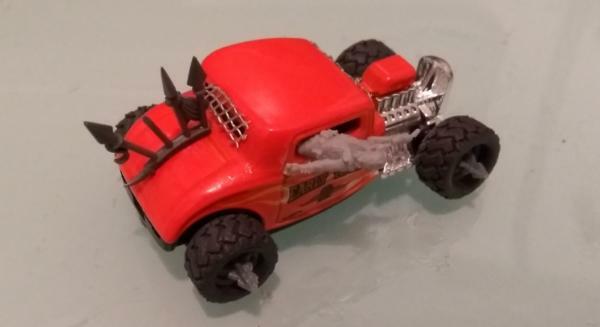 I am planning on messing about with gaslands again in the near future, I have never stripped any of the cars, but I’m told (by internet posts) that you should strip the cars with MEK as the paint and n most cars cover up great details. Have you considered doing so? I've thought about both that and drilling out the rivets to get at the inside. 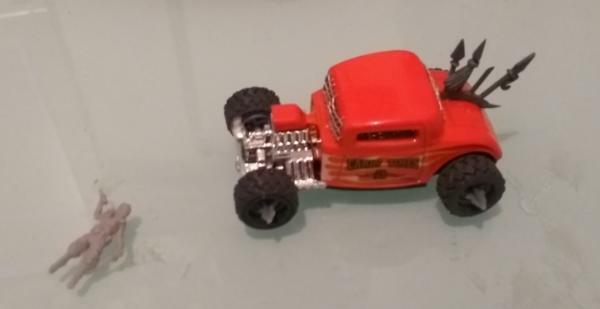 But to me the point/fun of Gaslands is that it's not much work to make game worthy cars. So beyond flinging new wheels on new axles, and removing occasional bits of transparent plastic, I'm leaving them as they are. I agree in finding a better place for your head, lest it end up upon a pike. 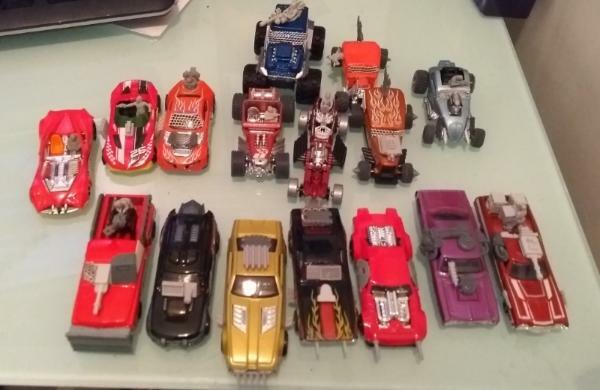 That's quite a gaslands horde you got there, sir. Keep up the good work. Briancj wrote: I agree in finding a better place for your head, lest it end up upon a pike. Warboss_Waaazag wrote: That's quite a gaslands horde you got there, sir. Keep up the good work. Thanks kindly It's coming along I fond an old tackle box in the garage this morning that's ideal for storage, too. So on that note, on with the Gaslands Garage: it's biker time! 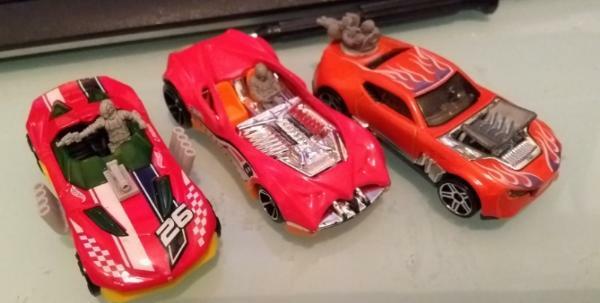 3 different packs of bikers from Mad Cars: Vesperados (ole! ), Cross Bikes and Choppers. Not entirely sure which will be which faction yet; I suspect the cross bikes will go be Slime, the Choppers Idris, and as for the Vesperados... dunno probably just roguish vaqueros for hire. The casts on these are... okay. The details are crisp, and there's not much flash, but I don't like the bases. I thought I would, because molded bases means no need to buy separate ones, right? Except a couple just sheared in half straight away when removing the excessively thick casting tab, even with a saw. Also, as you can hopefully see, one of the Vesperados is missing the handlebar/headlight. Not terribly difficult to fix, but mas enojadas. The cross bikes come with some great extras - a few billy cans etc - which will more than likely get appropriated for other vehicles. Need to look out some more chaos terminator spikes or something for them. The Choppers are great, but it bugs me slightly that the Cross Bikers and Chopper bikers have different waist/torso joins (the cross are flush, the chopper tab and slot) making it difficult (though not impossible) to mix and match. I've also got a "postapo chariot" which is, well, a chariot with a couple of bikes lashed to the front, but I think that's going to get converted back into bikes and harvested for bits generally. Subject: Re:Graven's Shelf of Shame Jan 29th: Cross Bikes, Chopper Bikes and Vesperados, oh my! I hope you give your feedback to the company that made the bikes, especially the mix-and-match part. Subject: Graven's Shelf of Shame Jan 29th: Cross Bikes, Chopper Bikes and Vesperados, oh my! Good work on all the car modifications. You need one with the Carmageddon mohawk blade though. Briancj wrote: I hope you give your feedback to the company that made the bikes, especially the mix-and-match part. Dr H wrote: Good work on all the car modifications. It's really difficult to resist just buying a Hot Wheels when I'm at the store; they're peanuts and it's like, "For the first time in my life, suddenly my hobby is affordable!" Anyway, let's do something different for a bit. 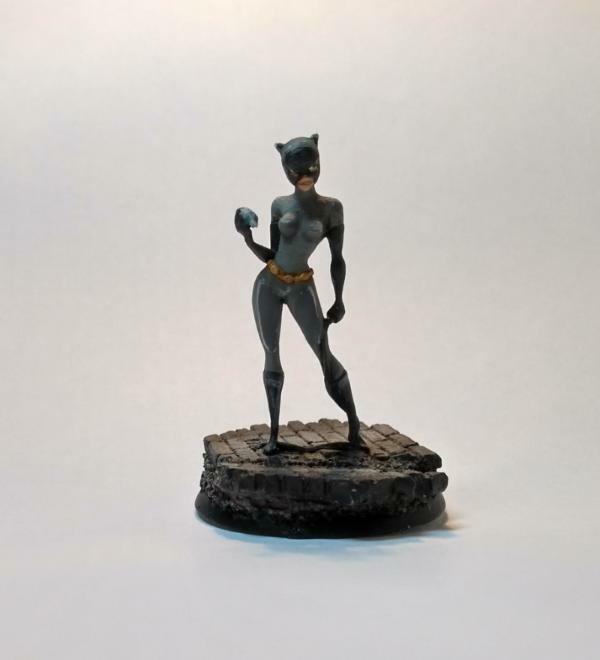 Yup, Animated Catwoman. She not quite done, getting those mad "hand-drawn" highlights right is a pain, as are big, slightly manga eyes. Slowly, I'm completing my collection of random Batman figs I am missing: down to just Animated Green Arrow and Animated Black Canary now. I've managed to track down get a Frank Miller Oliver Queen (who's WIP, but nothing interesting to show), Catman (ditto), and the last two promos I'm missing: one of the rarest, Red Hood Joker, and a bombshell Harley. Very pleased. Ada-lorana - phasing creature (primed black atm) and the captain model has some armour, so that's handy for representing a containment field of sorts. Sorak - 4 limbed purple thing, although I'm missing an arm and a leg which is why he never went in my Rebs team but that's fine, roboleg and scavanged arm here we come. Tsudochan - telekinetic monk, although mostly robes, so making the conversion clear will be tricky. 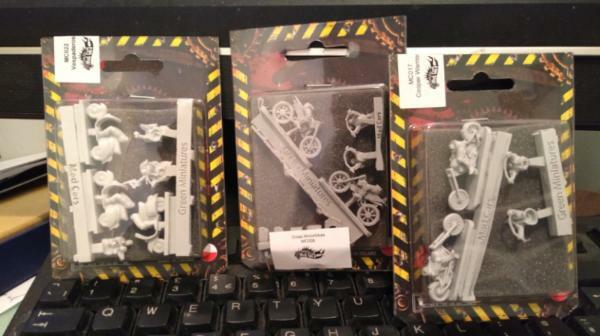 2 Zees - cheeky clone space monkeys, one's already built so will just get GS, the other converted up a bit. Veer-Myn - cyber Skaven; I'm going to have to mix and match parts from Deadzone ones to get a slightly different look. There's a couple of spare pairs of Veer-Myn legs, and indeed heads, there too, so might make more than one. I do love space skaven (spaven?) and it will mean decent numbers. Yndij - na'vi, basically - for which I have a spare Deadzone body, randomly. Unless one of those miniatures looks like Emilio Estevez, you are not allowed to make a Freejack joke. 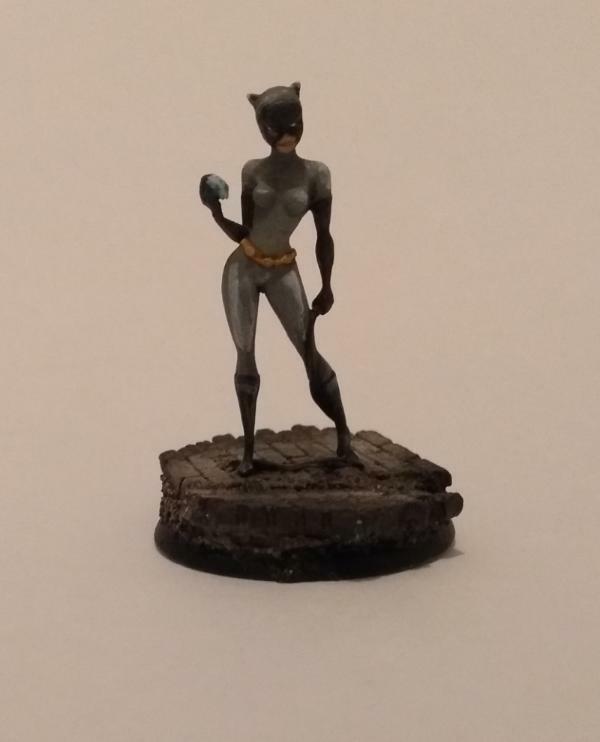 Oohh...Catwoman looks very cool. Glad to hear about the curry. Enjoy! Loving the Gaslands stuff! I need to be brave enough to drill out the rivets on one and break it apart. Who's to say he doesn't just have EE's brain? youwashock wrote: Oohh...Catwoman looks very cool. Glad to hear about the curry. Enjoy! The Power Cosmic wrote: Loving the Gaslands stuff! I need to be brave enough to drill out the rivets on one and break it apart. I'm not There are some where I've attacked the plastic with cutters from above. Great to have you aboard, btw! On the subject of Gaslands, got some tokens from The Model Exchange and an MDF Starting Gate, which looks like a fun build. 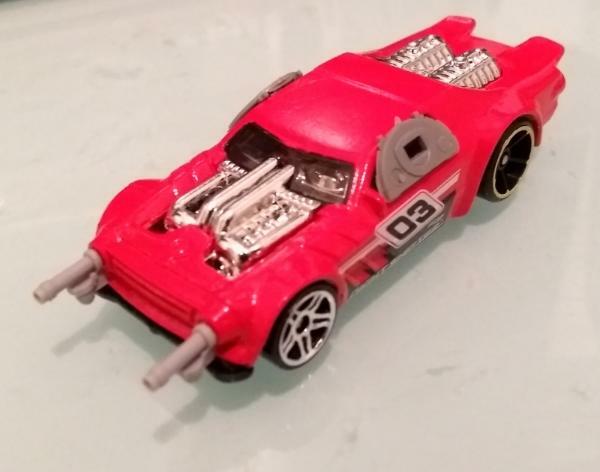 Also, whilst in the local geek store (A1toys.com) getting the boys a minifig and a pack of Transformers TCG, discovered that they sell a huge range of Hot Wheels for £1.49 (£1.99 in the supermarket) - and I get 10% in the store too. This will not end well managed to resist for now, but it's only a matter of time. Of course, I've now realised I'm missing BTAS Harley too from my collection Typical. Model number 13 of January, not part of February's count. Not bad, though way off for beating last year's score not that I actually plan to. GS on the Zees so that they match the pre-existing prone player markers; seriously - why make prone players of something that's not even on the standard team?! This was the initial ideal behind this whole side-project anyway (that, and owning 3 of the Zee captain, somehow) so had to be done. 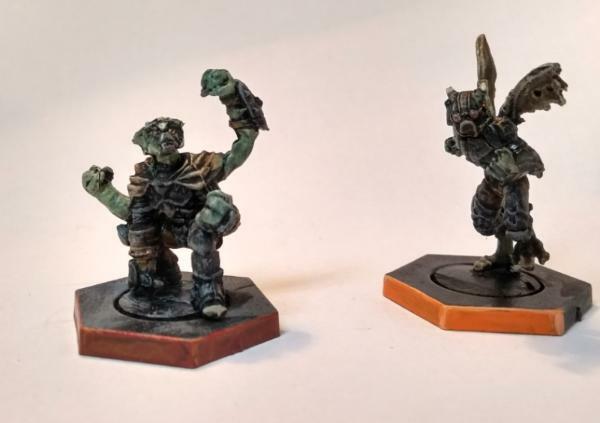 I realised that my Sorak was actually a Deadzone one when I found his remaining arms holding a blaster - which explains the dagger and grenades! Given that the only DZ stuff I own is Nameless, this is slightly baffling, but still. So, blaster trimmed, lopped off a horn, added a gs half-face plate. The advantage with this version of him is he's in heavier body armour, so closer to the general cyborg aesthetic. The weaponry may just get integrated into armour. 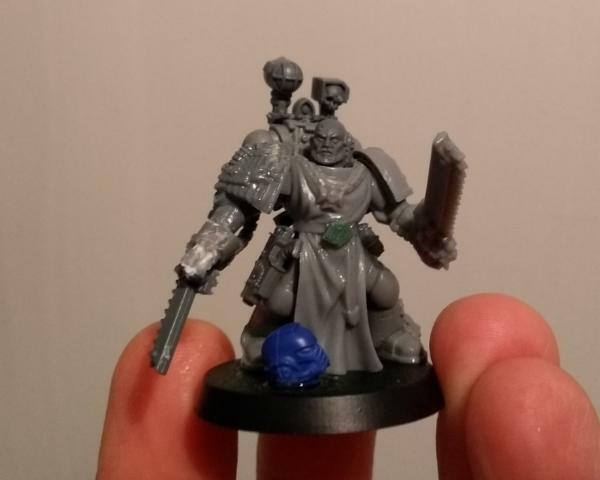 Forge Father has a new arm, from the Brokkr mining droid, and a nice teenage squat beard (!) just to de-emphasise him as the FF Captain (who's a striker, not a jack). He'll need that loin cloth chopped though. Clipped the horns off the Ada-Lorana Captain's helmet and breastplate, so his head now matches the look of regular Ada-Lorana Jacks. Added a gs control box of sorts to the front of the Tsudochan. Yndij is a DZ body (mystery again), gave him human (maybe?) DB arms - really happy with the pose. Tail went into boiling water to get curled round, rather than just sticking straight out. I might actually run him as a Striker as he looks like he's mid-pass (or steal). Also Yndij Strikers are stunningly good, if expensive. And the damn Veer-Myn are breeding like, well, vermin. Generally, some more cabling needs done, and some more armour. They're Borg, essentially, so need some chunky stuff. But I'm pretty happy with how they're coming along. The freeze, whilst not as dramatic as stateside, has put a... freeze on priming, however. Sub-zero is not conducive to spray paint. So next up on the painting pile is back to old we've all got coughs and colds, it's clearly a sign plaguebearers, bilepiper, scrivener, biologus and the Armigers are all going to get filthy. My cats are looking at me funny because I’m purring . 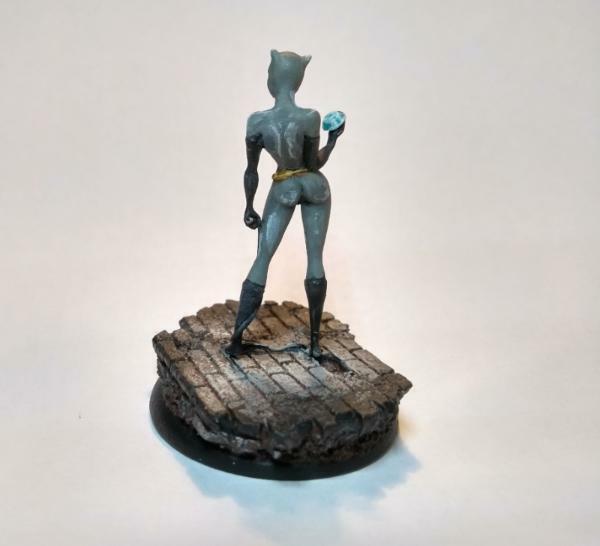 Great work on BTAS catwoman.